trivial ctor Note: this is just for derived classes a Filter initialised through this constructor will not work! Class that helps perform filtering (Butterworth, Davison, Rubin and Salam, arXiv:0802.2470) and trimming (Krohn, Thaler and Wang, arXiv:0912.1342) on jets, optionally in conjunction with subtraction (Cacciari and Salam, arXiv:0707.1378). To obtain trimming, involving for example the selection of all subjets carrying at least 3% of the original jet's pt, the selector would be replaced by SelectorPtFractionMin(0.03). To additionally perform subtraction on the subjets prior to selection, either include a 3rd argument specifying the background density rho, or call the set_subtractor(...) member function. If subtraction is requested, the original jet must be the result of a clustering with active area with explicit ghosts support or a merging of such pieces. If the original jet was defined with the Cambridge/Aachen algorithm (or is made of pieces each of which comes from the C/A alg) and the filtering definition is C/A, then the filter does not rerun the C/A algorithm on the constituents, but instead makes use of the existent C/A cluster sequence in the original jet. This increases the speed of the filter. See also 11 - use of filtering for a further usage example. Support for areas, reuse of C/A cluster sequences, etc., considerably complicates the implementation of Filter. For an explanation of how a simpler filter might be coded, see the "User-defined transformers" appendix of the manual. Definition at line 97 of file Filter.hh. 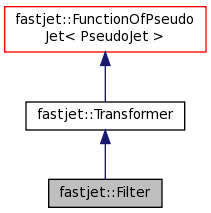 define a filter that decomposes a jet into subjets using a generic JetDefinition and then keeps only a subset of these subjets according to a Selector. Optionally, each subjet may be internally bakground-subtracted prior to selection. Definition at line 116 of file Filter.hh. Same as the full constructor (see above) but just specifying the radius By default, Cambridge-Aachen is used If the jet (or all its pieces) is obtained with a non-default recombiner, that one will be used. Definition at line 124 of file Filter.hh. Same as the full constructor (see above) but just specifying a filtering radius that will depend on the jet being filtered As for the previous case, Cambridge-Aachen is used If the jet (or all its pieces) is obtained with a non-default recombiner, that one will be used. Definition at line 136 of file Filter.hh. Set a subtractor that is applied to all individual subjets before deciding which ones to keep. It takes precedence over a non-zero rho. Definition at line 144 of file Filter.hh. runs the filtering and sets kept and rejected to be the jets of interest (with non-zero rho, they will have been subtracted). Definition at line 81 of file Filter.cc.